El buque para la formación pesquera "Intermares", Fue construido en el astillero Armón de Vigo está concebido para la realización de funciones de enseñanza por mares de todo el mundo, en especial por los de aquellos países que en la actualidad tienen suscritos acuerdos de cooperación con España en esta materia.La nave, que podrá albergar un total de 73 personas entre tripulantes, personal docente y alumnos, presenta como novedad la existencia a bordo de una embarcación auxiliar para enseñar las diferentes modalidades de pesca. 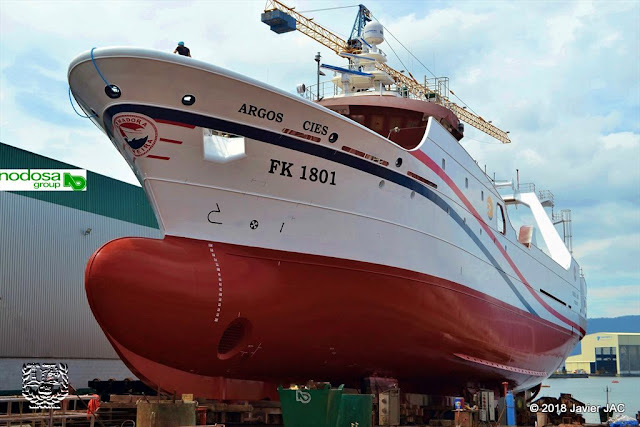 On January 12th, the new fishing cooperation vessel "Intermares" was launched at Armón Vigo Shipyard,in Vigo - Spain. VICUS Desarrollos Tecnológicos S.L. designed the high efficiency rudder which has been fitted to the vessel. The rudder blade geometry has been designed using the most advanced CFD tools, and has been optimized to allow recovery of part of the rotational energy in the water flow leaving the propeller. 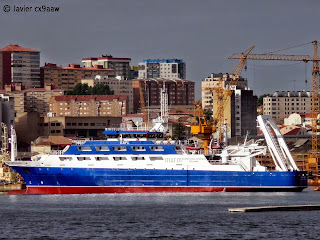 For this design, VICUSdt calculated by means of CFD codes, the water flow over the hull and on the propeller, and then rudder blade profiles have been optimized so that the blades works as a "stator" improving propulsive efficiency. 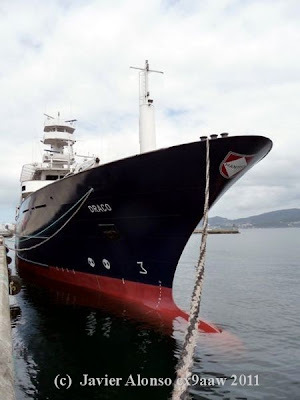 The final design of the rudder was tested at the towing tank of the Naval Architecture School in Madrid, obtaining very satisfactory results confirming the predictions made and reaching a reduction of power - consumption of 4% for speeds of 15 knots and above. This percentage could save at least € 50.000-100.000 year. 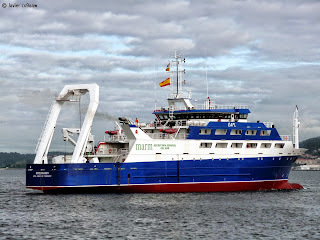 The ship's propulsion system has been supplied by Baliño SA, from Vigo and has a controllable pitch propeller of 3.5 m diameter and a power of 2290 kW. 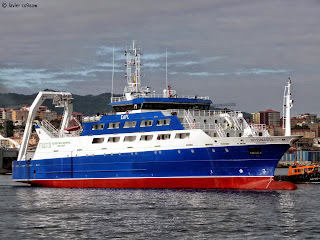 The ship, which can accommodate a total of 73 people, including crew members, teachers and students, has as an innovative feature an auxiliary boat onboard to help teach the different types of fishing. 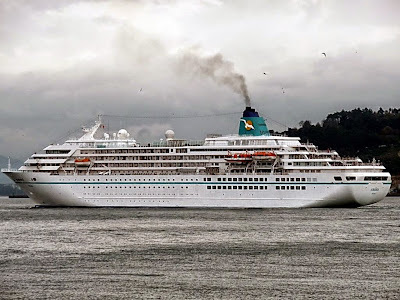 - Length overall: 79.20 m.
- Length between perpendiculars: 70.00 m.
- Depth to main deck: 6,50 m.
- Depth to upper deck: 9,00 m.
- Depth on deck Castle: 11.50 m.
- Speed 100% MCR: 15.6 knots. - 85% MCR range: 20,000 miles. 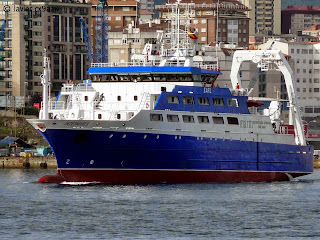 Thank you for let me this valuable information from the ship Intermares, teaching is always good stay current on these magnificent ships being built at our shipyard to everyone, with the most high-tech that few countries can develop.